As you probably know by now, I collect magazines featuring RHCP. I have my list of ones I’d really like and there were two magazines on the ‘holy grail’ list for me… I saw one of them for sale for the first time about a month ago but the postage was a rip-off and I reluctantly let it go; but then a week ago, I saw another posting for it which was a lot cheaper and I had to get it! It arrived this morning so I’ve just scanned and uploaded it – there’s also a full transcript. I don’t think many people will have seen it before as it is pretty rare. Smoke: Don’t let the magazine title put you off; I really wanted it as it’s so rare and one of those iconic magazine covers but I thought the content would be very limited given the publication- I was very wrong! 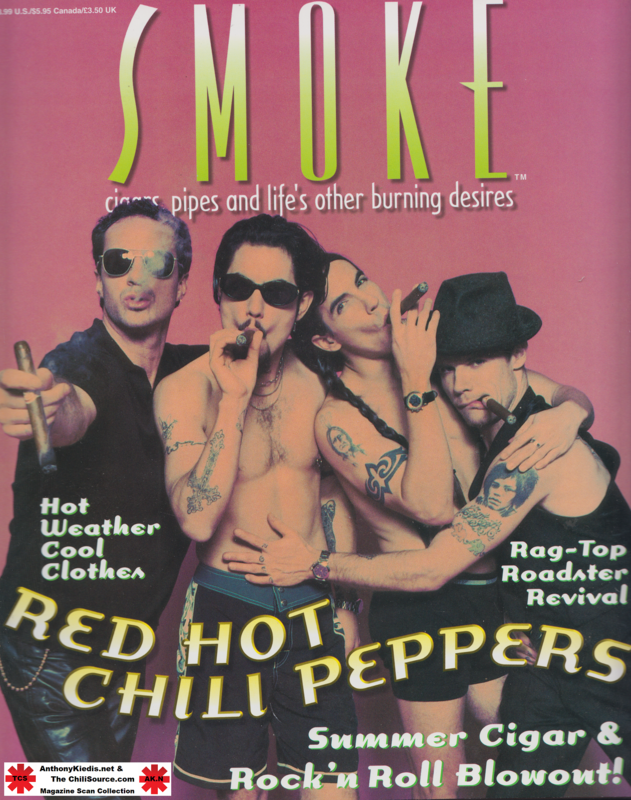 There are a few photos of the band with cigars and a few references to smoking them but it’s mostly a lengthy article talking about working with, then new boy, Dave Navarro and One Hot Minute.